Opportunistic, aggressive, territorial and potentially dangerous, the bothersome fire ant is preparing to reemerge from its winter safe haven as the weather begins to warm. Springtime represents mating season for the fire ant and as their activity increases, they may choose to call either the outside or inside of your home or office their family compound. Either way, the fire ant packs a nasty punch to unsuspecting landlords who unknowingly harbor their crew. Appearance: Fire ants can present as both reddish brown and reddish black in color and vary in size from 1/8 to 1/4 of an inch long. They are a typically segmented insect with antennae, stinger, and three sharp teeth on their destructive, tiny heads. 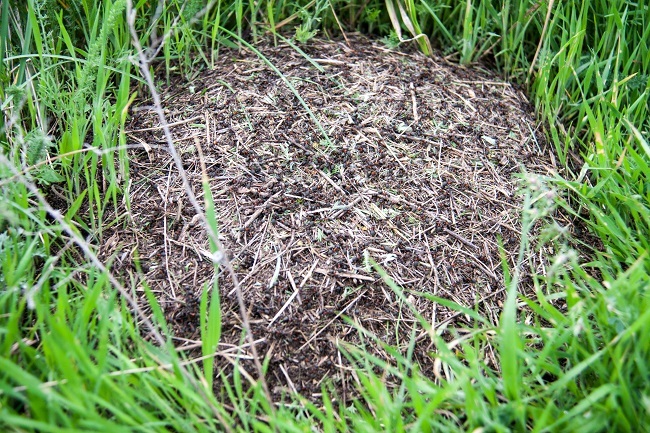 Nests: Fire ants build and live in a characteristic mound like structure that at times can be tricky to notice. Recent research at Texas A&M finds that “in cold, dry areas such as the High Plains of Texas, mounds are usually much smaller and harder to detect.” Nests that are often times unknowingly disturbed, can result in violent behavior from their inhabitants. Behavior: Fire ants are considered especially aggressive when their mounds are disrupted. When disturbed, fire ants emerge aggressively, crawling up vertical surfaces, biting and stinging “all at once”. A sting usually leaves a blister on the skin. Some victims experience nothing more than an irritation and others can suffer deadly consequences just as they might from multiple bee stings. Once you have identified that you have a fire ant problem, it’s time to eliminate them. At AJB Pest and Termite, we understand the inherent threat fire ants create in your home or place of business. We share in your sense of urgency in eliminating this type of danger and our family is here to serve and protect your family against the very real threat the fire ant brings to our community. Contact us at the very first sign of fire ant invasion, we are here and ready to not only eliminate the threat but permanently smolder the fire.